Slim Profile. The Purair BIO is one of the narrowest BSCs on the market and permits easy passage through standard doorways. 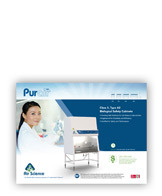 The Purair BIO uses self-contained HEPA filters designed to physically capture particles larger than 0.3 microns with >99.995% typical efficiency. 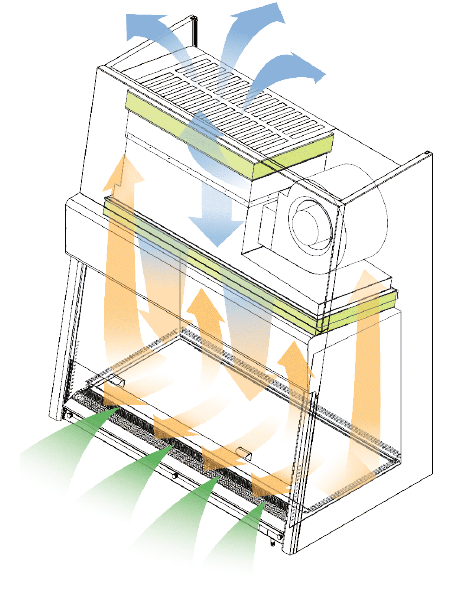 The Purair BIO maintains an airflow ratio of 70% recirculation to 30% exhaust to ensure operator protection. The Purair BIO maintains one of the world’s highest performance ratings for a brushless DC motor. Contact Air Science or your sales rep for preparation information. Purair Bio AS-AHA-103-CA-B, shown with optional base stand. A. Energy Efficient: The quiet, internal EC Brushless DC Motor ensures sufficient airflow across the work surface at all times while saving up to 86% over traditional PSC motors (based on internal testing). B. Standard Control System: Includes simple, reliable membrane-style switches and an easy-to-read gauge for safety and durability. 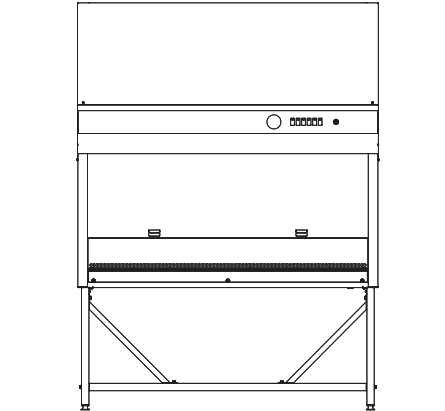 C. HEPA Filtration Lock: The patented Quick Access HEPA Filtration System allows filter changes to be performed from the front of the cabinet by a single person without tools. D. Paper Catch: Protective screen located at the bottom of the rear air return plenum prevents wipes and other paper products from being drawn into the blower system. E. Double-Wall Plenum Design: Double-wall design creates a unique plenum which surrounds contaminated areas with negative pressure, preventing the possibility of contamination from leaks in ﬁlter seal, gasket, or cabinet structure. F. Air Velocity: The air velocity and associated correction factors are preset at the factory to meet regulatory requirements and ensure operator safety. 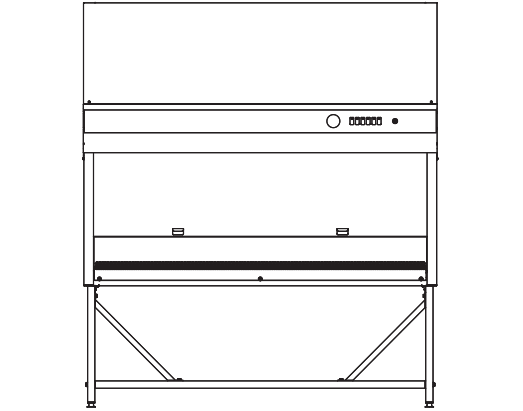 G. Surround Air Intake Grille: All contaminated air is enclosed in the work area. No safety dead zone. H. Outlet: Outlets are installed in the work area to guard against electrical shock. I. Durable Interior: The Purair BIO utilizes a heavy-gauge, one-piece liner with coved corners for enhanced durability. J. Ergonomic Fit: The angled front, narrow-front grille, and frameless sash create an ergonomic work environment. The #304 stainless steel elbow/arm rest provides ergonomic forearm support to prevent grille blockages and improve posture. K. Safe: Includes HEPA ﬁlters (Class H14) tested to a typical efficiency of >99.99% for 0.3 micron particles. NSF Certification applies to the biological safety cabinet models AHA-133-AA-B (Air Science Model (AS-AHA-133-AA-B), AHA-133-AB-B (Air Science Model AS-AHA-133-AB-B), and AHA-133-CB-B (Air Science Model AS-AHA-133-CB-B), as well as AHA-133-AC-B (Air Science Model AS-AHA-133-AC-B), AHA-133-CA-B (Air Science Model AS-AHA-133-CA-B), and AHA-133-CC-B (Air Science Model ASAHA-133-CC-B) manufactured by Chung Fu Technical Development Co. Ltd., Taipei, Taiwan, and marketed by Air Science, LLC, USA. 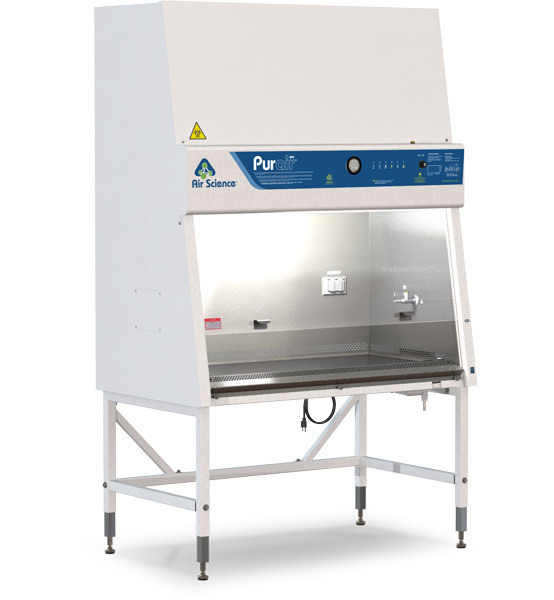 Standards Compliant: The Purair BIO undergoes 10 internal quality tests prior to leaving the factory, including pressure decay testing, downflow velocity testing, and HEPA filter leak testing. 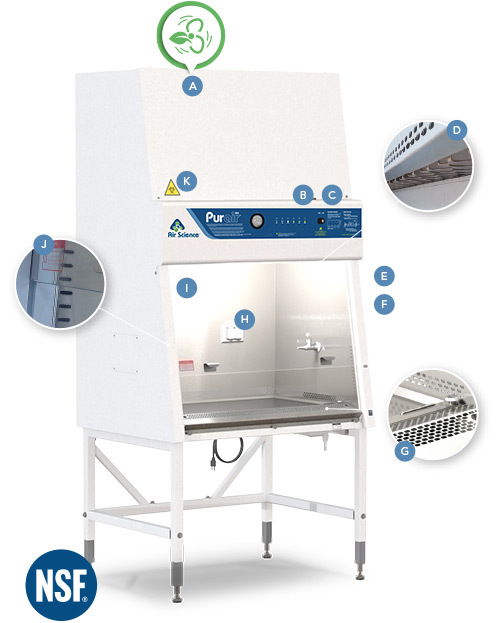 Full Product Support: The best value Class II Biological Safety Cabinet on the North American market supported by nationwide sales and service representatives.